Aficionados of modern high tech gadgets will by now be familiar with the Samsung Galaxy Gear 'smart watch'. Even though I worked for intel during the earlier part of the technolological revolution (until 1997), as far as watches go, I still prefer 'old tech' and new-fangled 'must have' devices leave me cold. 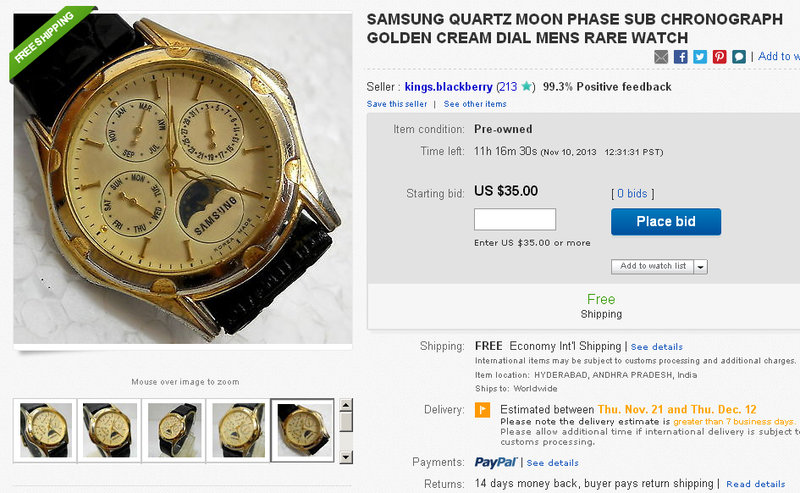 But seems Korean electronics giant Samsung may have been dabbling in watches for a while. 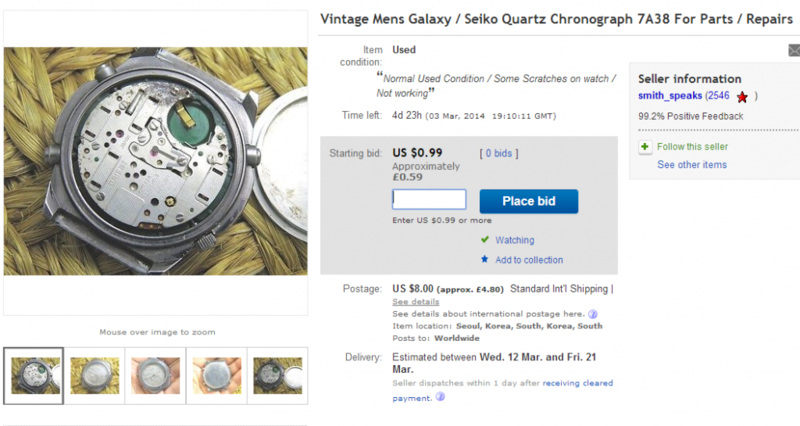 I woke up about 8:30 this Sunday morning and while still not quite wide awake, ran a worldwide search on eBay on 'Seiko 7A38'. 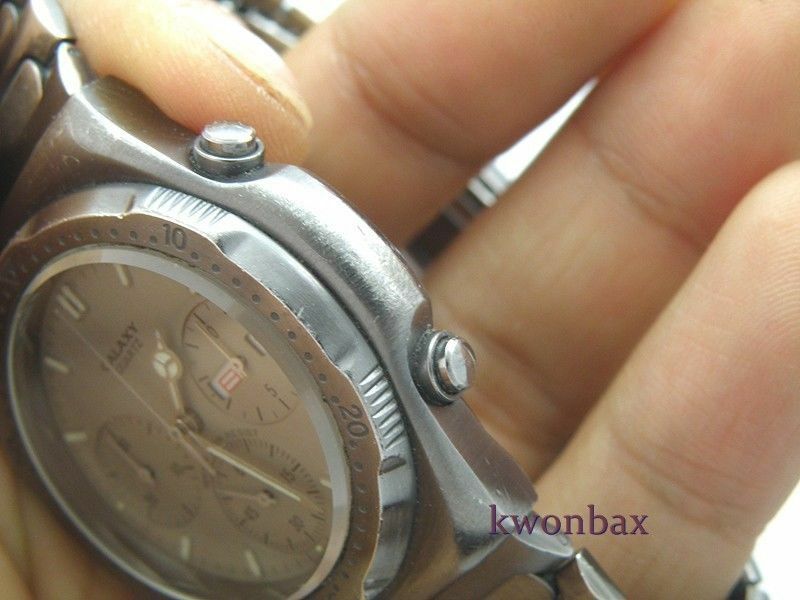 I'm not sure where Kwonbax got the Samsung connection from - other than GALAXY printed on the dial. Likely he's correct though. Whether that watch is genuine - or just another cheap fake that happens to be branded Samsung, is of course another question. 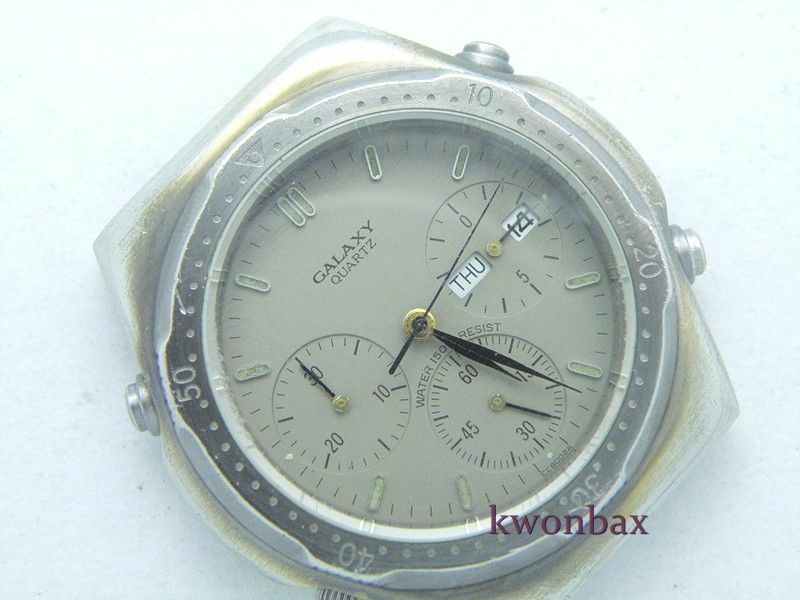 Interestingly, there's no 'KOREA MADE' printed at the bottom of the Galaxy's dial - just what looks like a dial part number CC8002A. 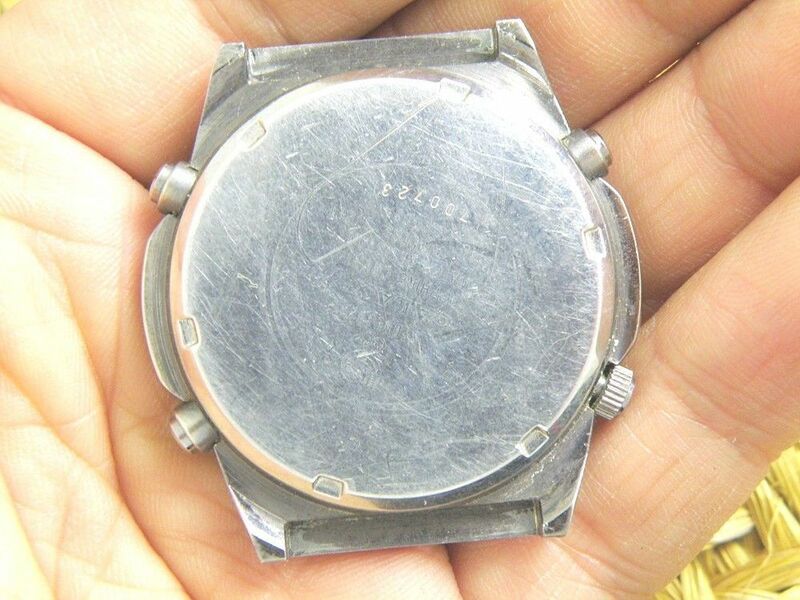 The sharply pointed sub-dial hands, with their short stub tails, are the usual parts bin item found on Orient, Racer and Puma variants. The movement (fitted with a Kanji day wheel) is clearly stamped Orient, and not surprisingly, inverting it you can also make out J3920. 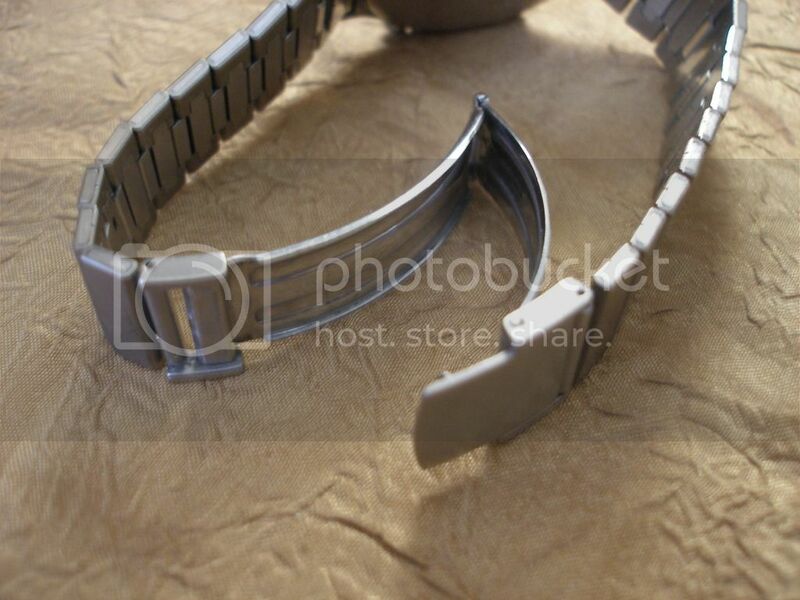 Note also that the bracelet has a part number YS3707 stamped into the underside of the second centre link section. With it's somewhat worn matt gunmetal finish, grey dial, thick crystal and mercedes hands, it put me in mind of my Racer J39723-70. All of which became somewhat academic, as far as I was concerned, a little over half an hour after I first clapped eyes the listing. 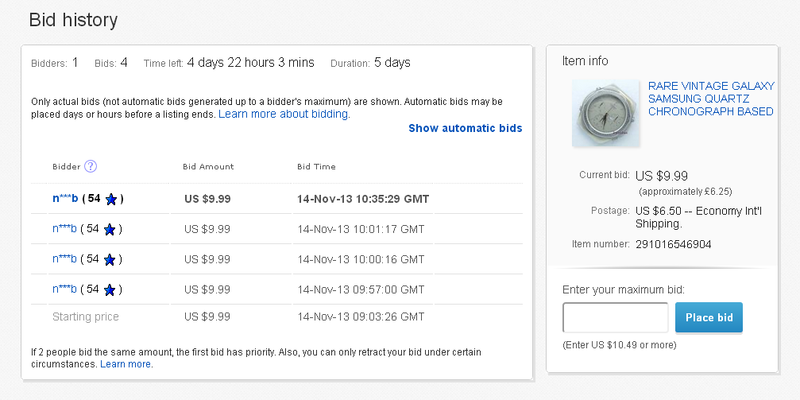 It's when you see the phrase: Bid with confidence!! on the bottom of an eBay seller's listing that you realize what a joke it is. Like a good eBay citizen, I placed a bid - which you can see on my screen print (taken at 8:40am this morning) and added the item to my watching page. I did think about messaging the seller and making him an offer, I'll admit. But instead, I went downstairs and made a cup of coffee and had a cigarette and while I was pondering, decided to message him telling him that I was definitely interested in the watch - and if anyone else made him an offer to end the listing early, to please give me first refusal on it. Dumb move, in hindsight. 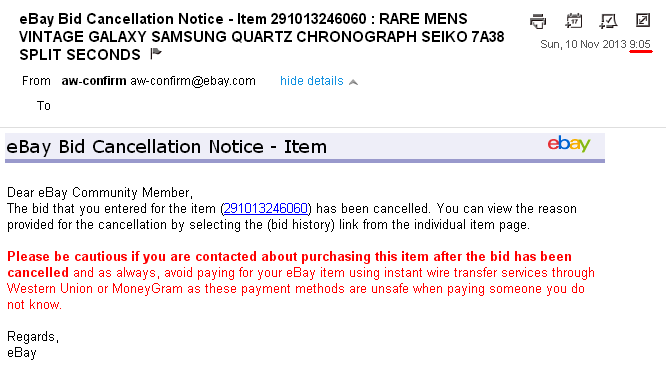 The 'error' in the listing was obviously the part about bidding with confidence !! Scrolling down my inbox, was a message from a forum member sent me at 8:11am this morning, while I was still in bed asleep. Look interesting as well. What do you think? I have mailed him for a buy it now price. Bearing in mind all the help and advice I've given this person over the last few months, to say I was less than impressed by his timing and inconsiderate underhanded tactics, is a minor understatement. Needless to say my email reply to him was somewhat brief. Apart from missing a bracelet, this 'head only' is, in most respects, in worse condition than the prevous example listed on Sunday. The lume in the batons appears to be discouloured (moldy?) 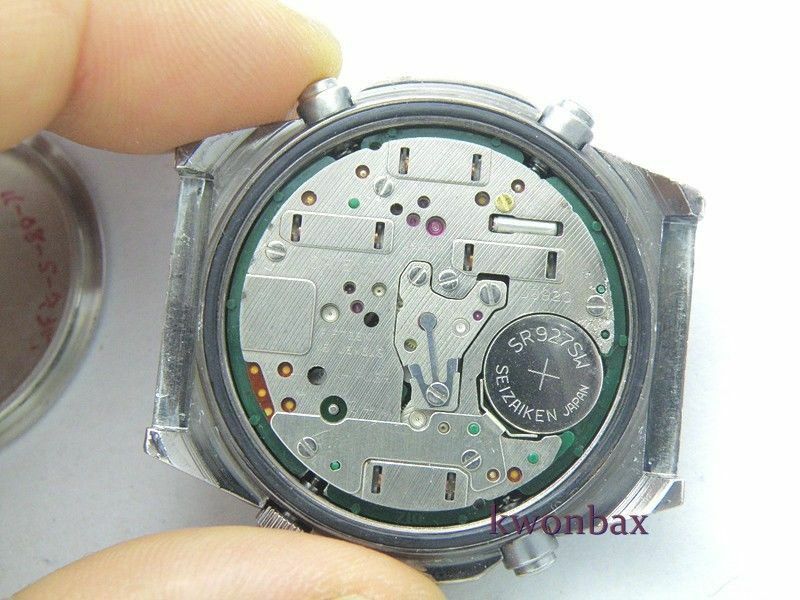 and the hands aren't original - probably came off a Seiko 7A38-7289. 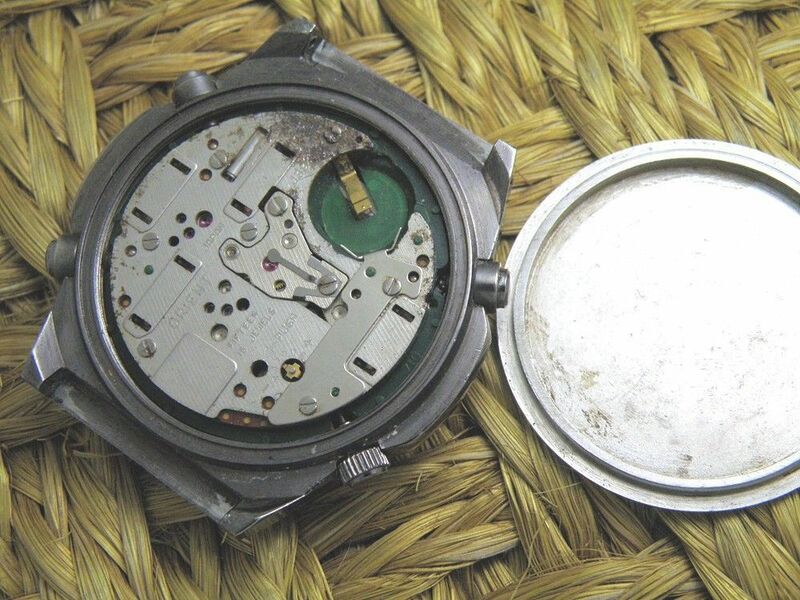 The movement back-plate looks suspiciously clean, as there is some evidence of past battery acid corrosion just above the battery. 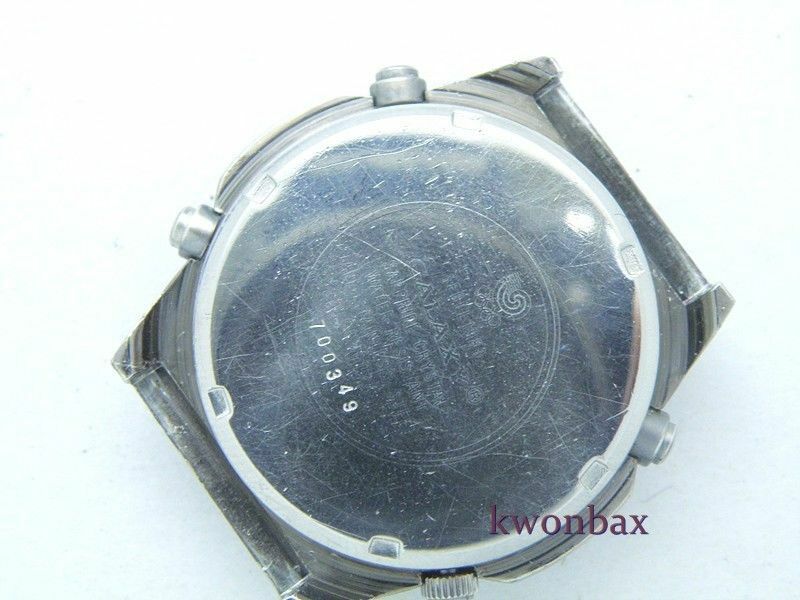 In this listing photo you can better make out the J3920 stamping (but not Orient). Note the tiny gold rotary step switch is missing too. 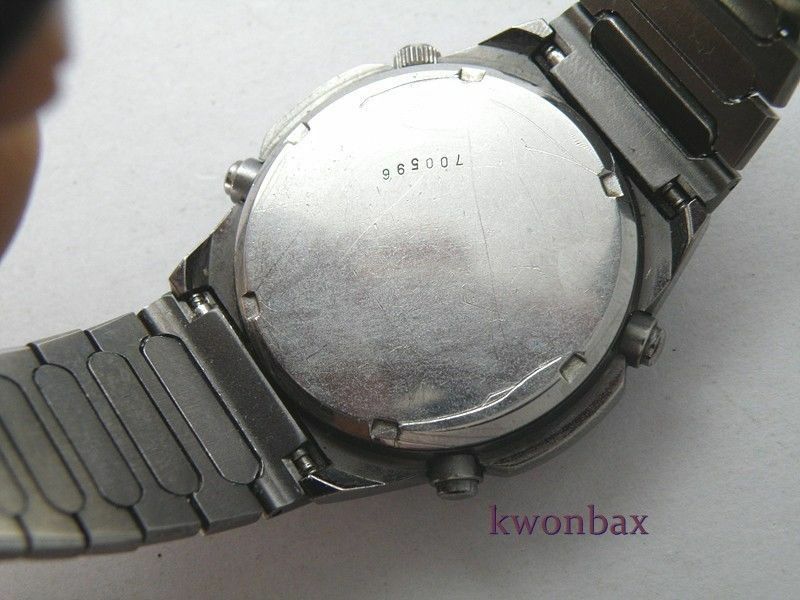 Where this watch scores over the previous otherwise more complete / original example is in the condition of the case-back fitted. 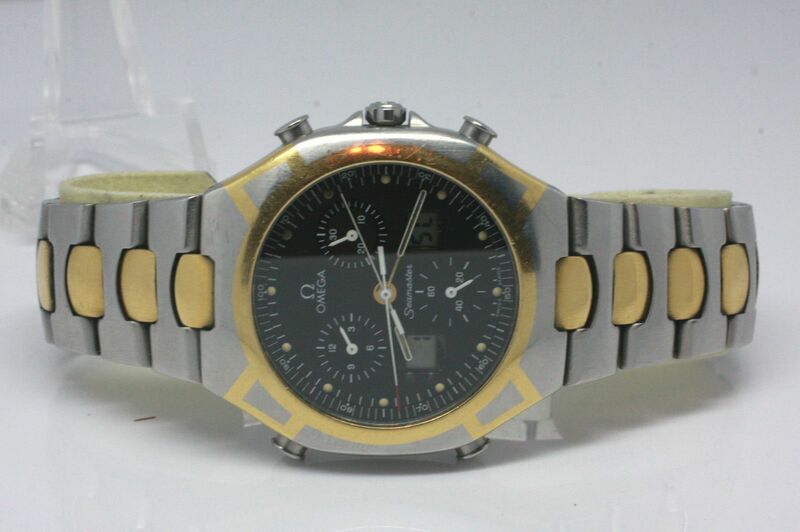 However, unlike that watch, which was clearly made by Orient Watch Co., the only stamping on the case-back is a serial number. Thought that was a bit strange at the time. Unless it was a poor photo, the engravings / stampings must have been worn away. The next line down is something undecipherable, possibly 'JAPAN MOVMT' - followed by the stamped 700xxx serial number. When Kwonbax created this new listing, he did so by re-listing the previous item, changing the photos and editing the description. 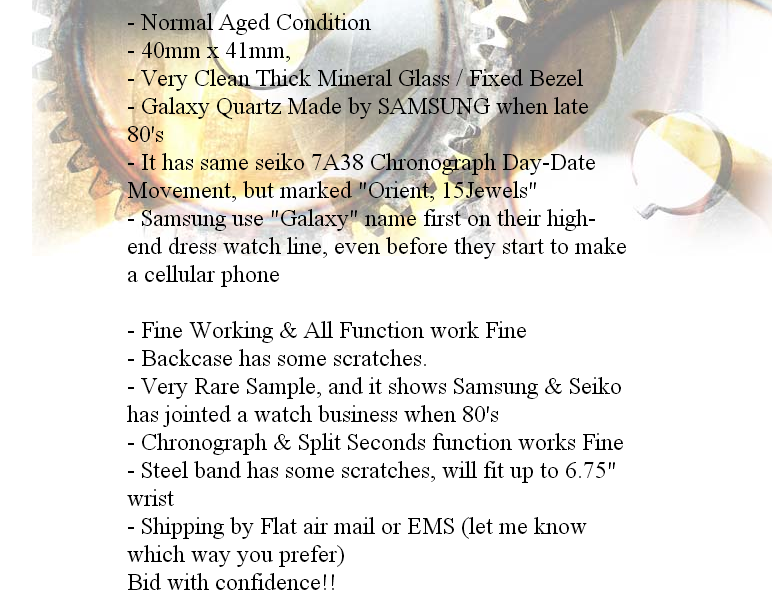 - It has same seiko 7A38 Chronograph Day-Date Movement, but marked "Orient, JAPAN 15Jewels"
- Samsung use "Galaxy" name first on their high-end dress watch line, even before they start to make a cellular phone. - Backcase has some scratches. How he had the gall to leave that part in after the last debacle astounds me. 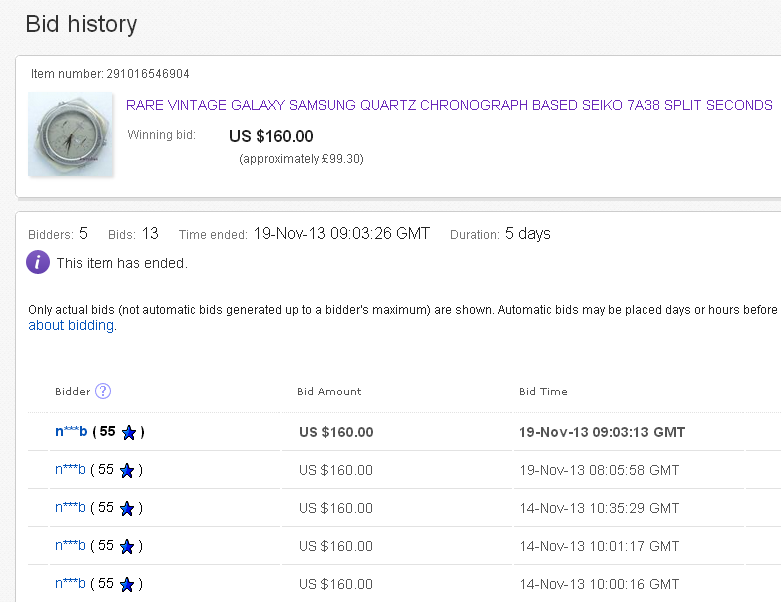 You'll possibly have noticed that when I took the screen print of the listing around 10:30am this morning there were already 4 bids. One presumes this person must be scared that someone else is going to approach the seller and ask if he has a Buy-it-Now price. The hypocrisy of some people has to be seen to be believed. I'm still in the process of editing the above post - there's quite a bit of information I've yet to add, when I can get a quiet moment or two. I came to refresh the screen, clicked on the eBay link and found he'd just this minute changed his eBay user ID to smith_speaks ! Edit: 5 minutes after that, this eBay notification wafted into my email inbox - hours after the fact (as usual). The last two bids placed this morning were 'safety bids' made by the same bidder n***b. He must have been expecting someone to snipe him. Quite frankly, it would have damned well served him right if they had ! 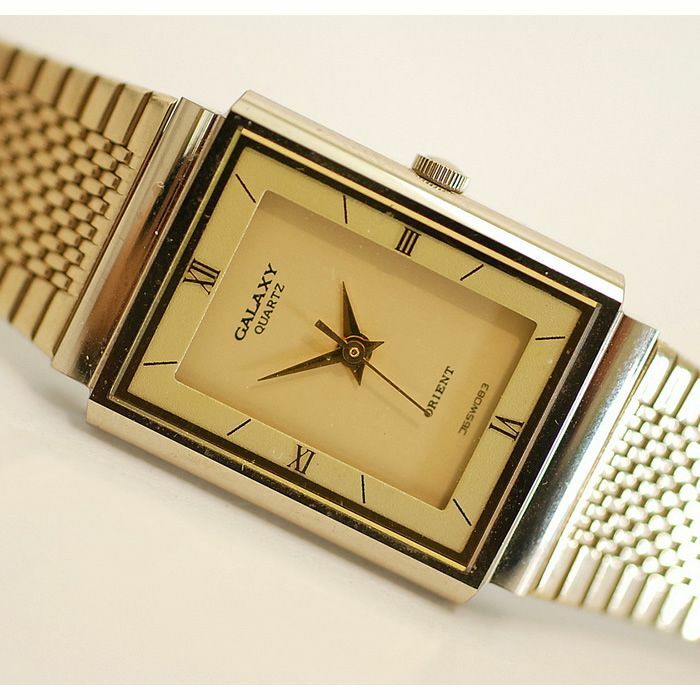 Coming back to the Samsung connection to this GALAXY branded watch (presumably manufactured for them by Orient Watch Co.). The 'swirl' from the 1988 Seoul Summer Olympics logo, which may well have provided Samsung's inspiration for the 'Galaxy' name. 1988 certainly seems to have been a significant turning point in Samsung's fortunes. Samsung’s association with the Olympic Movement began when the company became a local sponsor for the Seoul 1988 Olympic Games. In 1988, Samsung Electric Industries merged with Samsung Semiconductor & Communications to form Samsung Electronics. Samsung Electronics launched its first mobile phone in 1988, in the South Korean market. 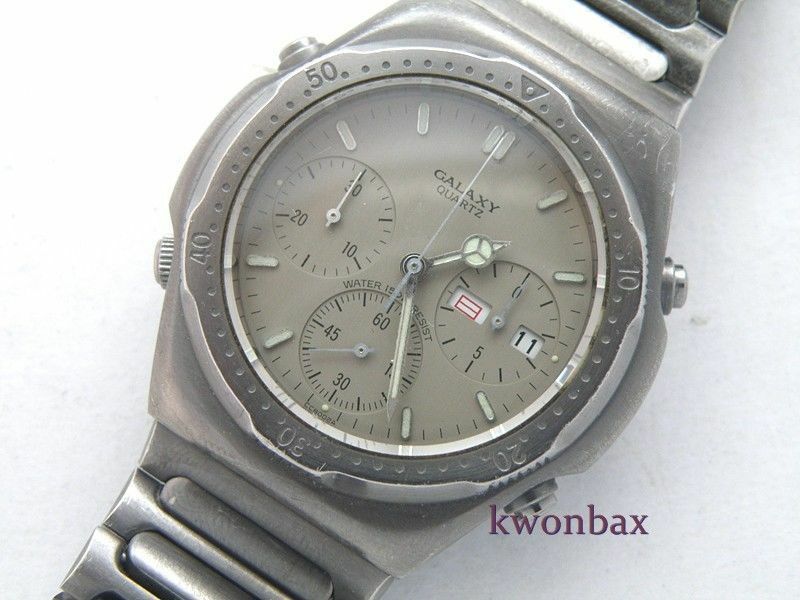 But when did they first actually register the GALAXY® trademark as seen on the case-back of this watch ? Was it in 1988 ? I've been trying to find their original application online. Must admit I'm getting tired of googling - there simply are too many results. I'm going to give up on this for now, but I have found some more information about earlier Samsung logos. The Samsung Electronics logo, (also) used from late 1980 until replaced in 1992. But 3 Stars (with or without Noodles) does not make a Galaxy. So 1988 would also have been the company's 50th Anniversary, though re-branding to their current logo didn't take place until 1993. Coincidentally, Samsung's founder Lee Byung-chul passed away this day, 19th November 1987. 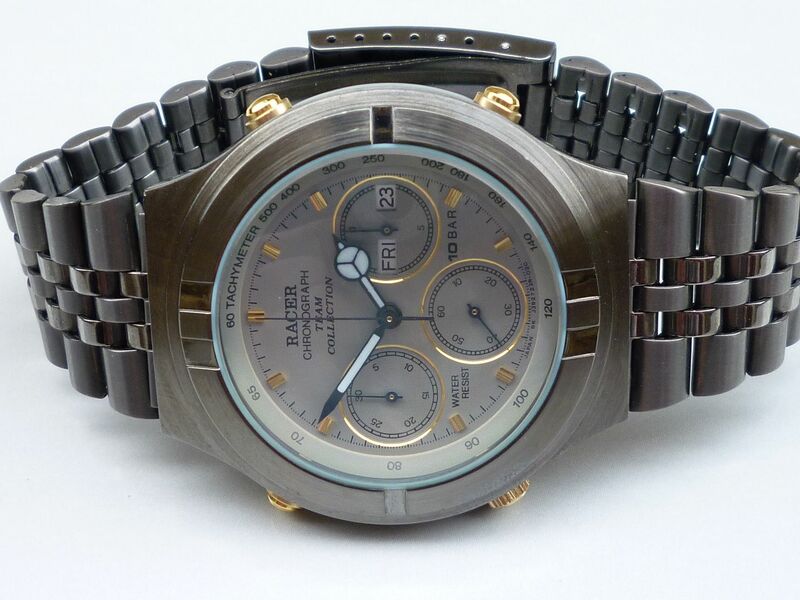 We know that Orient and Seiko shared a common manufacturing plant in the mid 1980's. 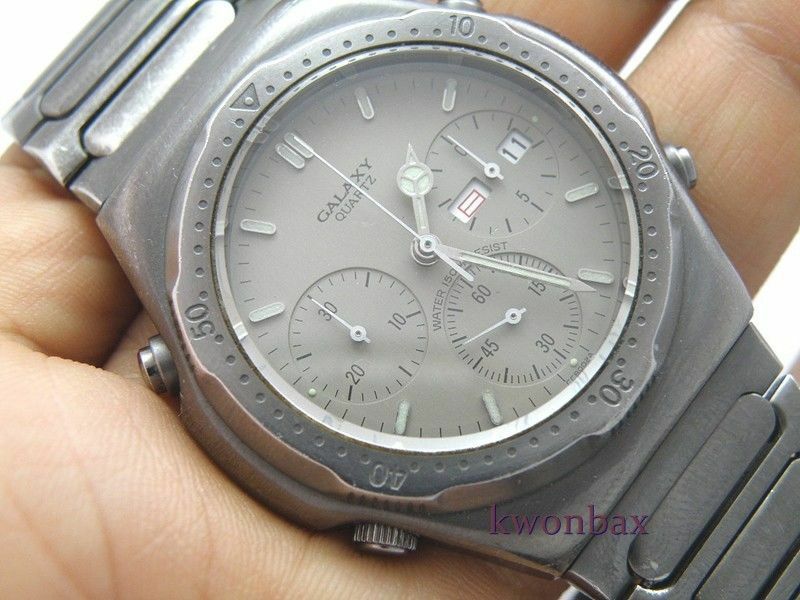 Whereas the Orient, Puma and Racer J39's clearly use Orient's style of case-back marking / nomenclature, the case-backs of these Galaxy branded '7A38's, which I really should be referring to as 'J39's, carry a completely different set of embossed markings, presumably designed by the end customer, Samsung. 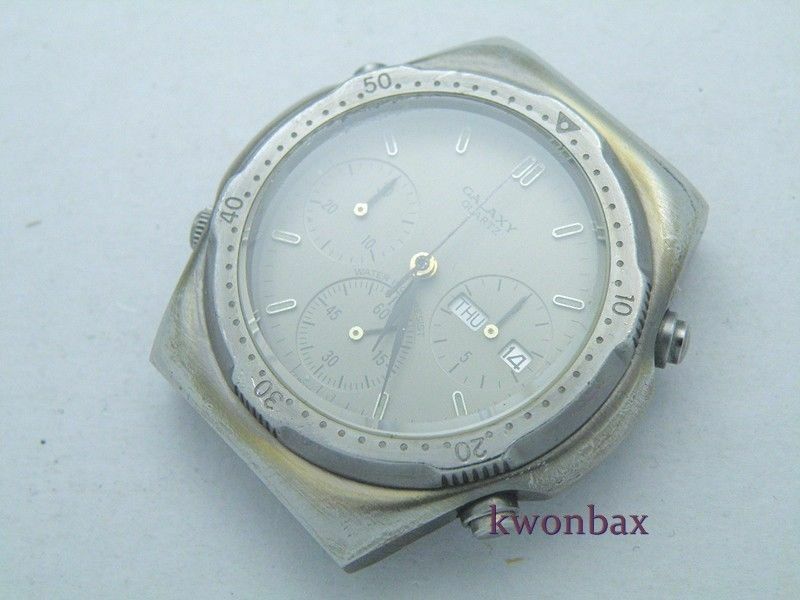 Could it be that the 700xxx 6-digit case-back number stampings were instigated by Seiko rather than Orient Watch Co. ? If they were, then from these two examples, it would indicate their date of manufacture was October 1987 - in plenty of time for the 1988 Olympics. Something else to note. The first 3 digits of their 700xxx (or more correctly 7O0xxx) serial numbers are neatly aligned, as if machine stamped. The last 3 are not - far from it, possibly stamped later by hand. 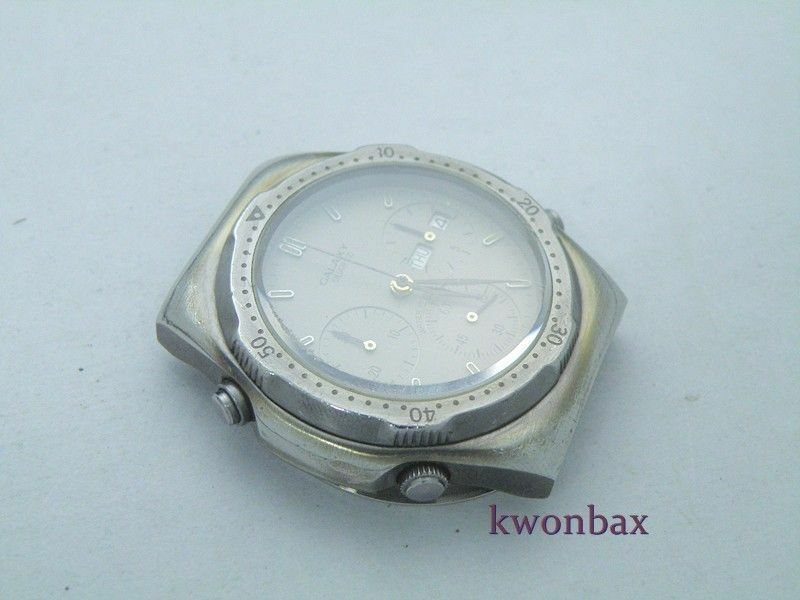 Were these a 'limited production' run of up to 999 watches ? IF they were a limited edition of any kind, it's possible that these watches were produced with a specific purpose in mind. 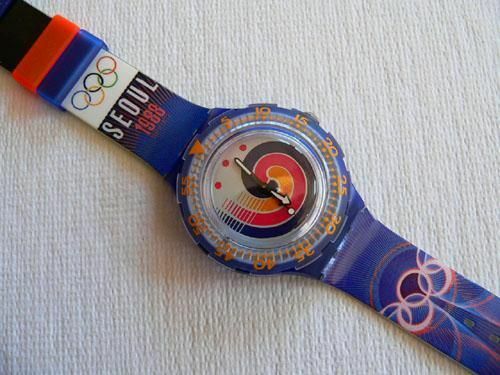 A Seiko 7A38 as the official watch of the 1988 Seoul Olympics ? Erm No - I don't think so sadly. 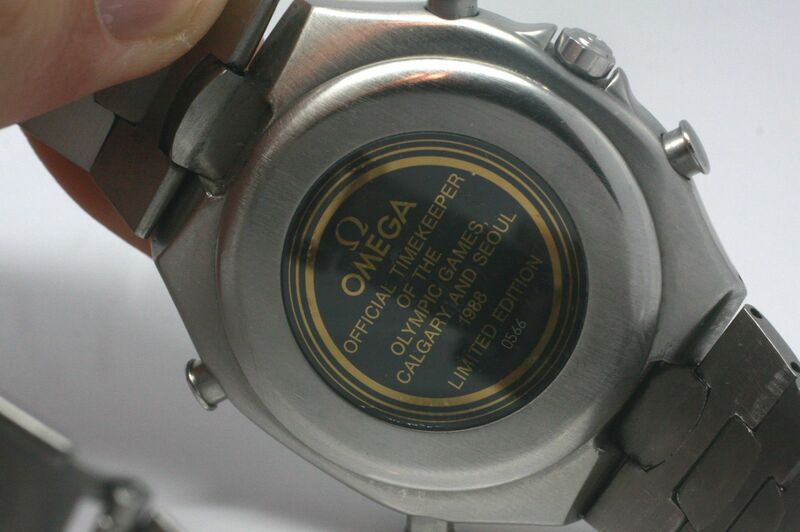 Apart from the fact that their dials only carry the GALAXY logo and all references to the 1988 Seoul Olympics are hidden away on the case-back - and although Samsung may have been the local sponsor of the 1988 Summer games, the official timekeepers were OMEGA. 1988 Calgary and Seoul were the first Olympic Games with computerised timekeeping, results and analysis stored in databases for posterity. The OMEGA video matrix board boasted colour images in Seoul. 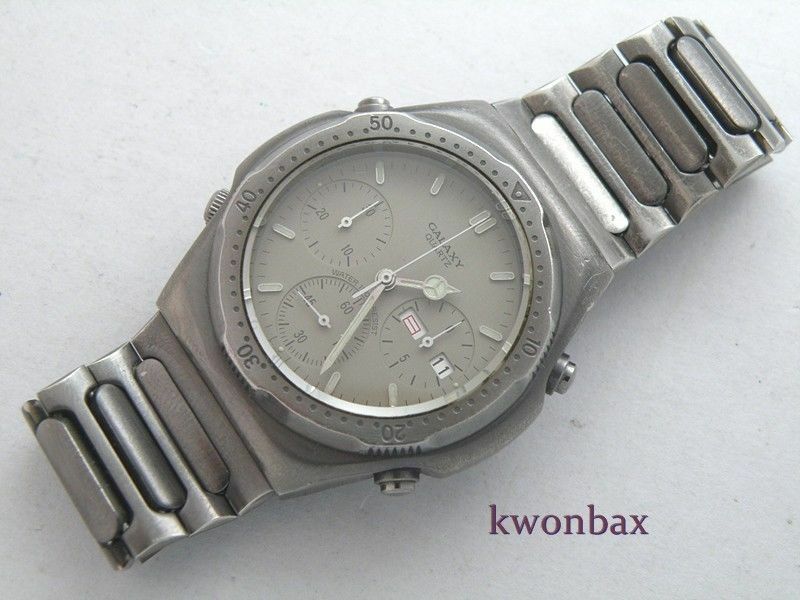 If you search on 1988 Olympics Seoul watch, you're likely to find (lots of) images of a rather cheaper offering from the Swatch group. 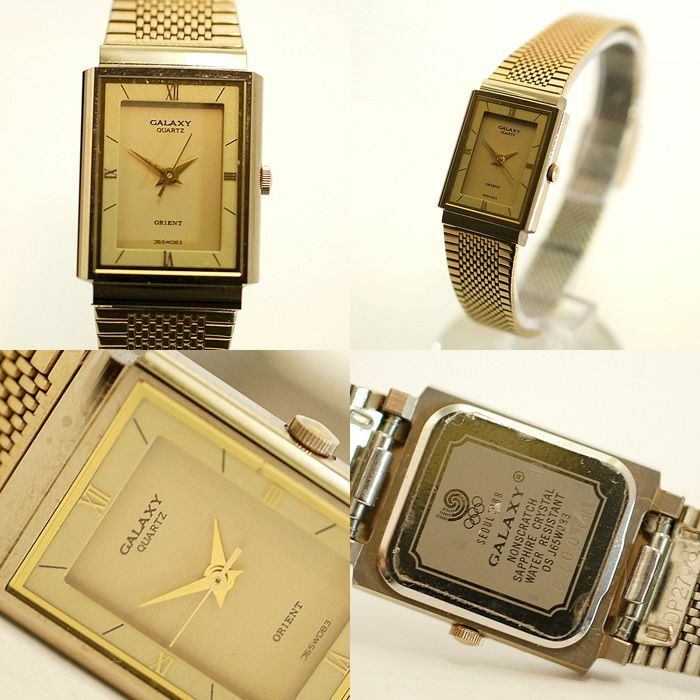 http://www.swatchandbeyond.com/index.php?ukey=category_search&searchname=1988 (there's a few currently listed on eBay too). 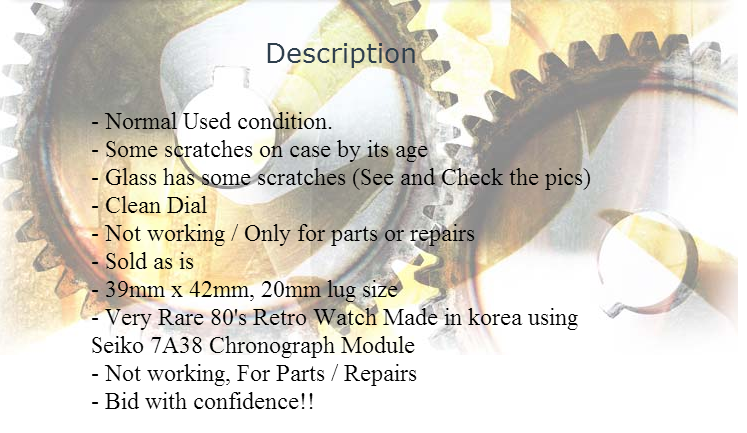 it appears these (S)watches were produced retrospectively, as a 'collectors limited edition series' - in 1994 ! This morning I phoned Samsung's UK HQ in Chertsey, Surrey hoping to talk to someone in Branding or Marketing. No joy. I then got redirected to their PR agency in London and spoke to a young lady who wasn't even born in 1988. Anyway, I've sent them an email asking them if they'd be kind enough to forward it to someone in Samsung who might help. 1) When did Samsung first start using the Galaxy sub-brand ? Was it 1988 ? 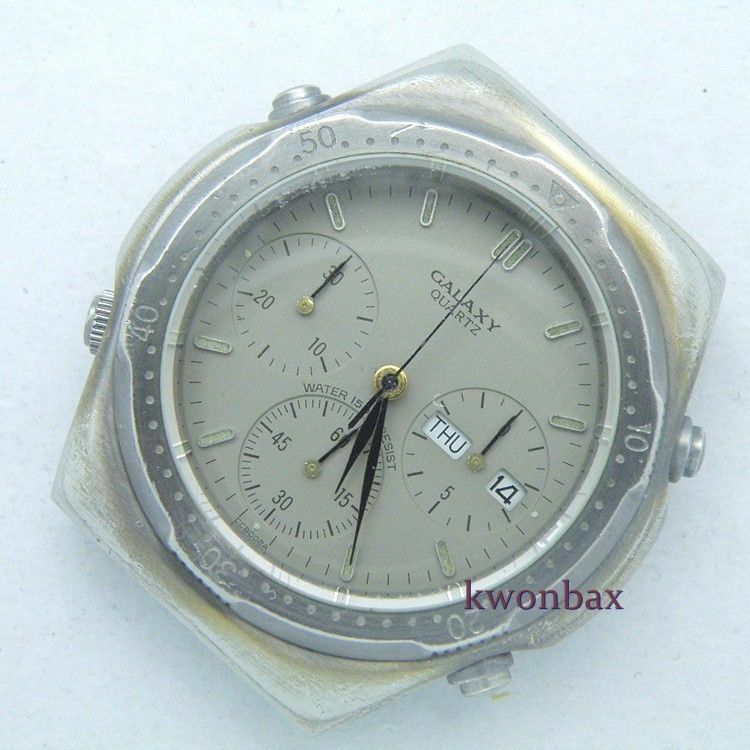 2) What other products was it used on (at that time) besides this Galaxy branded watch ? 3) When was the Galaxy trademark / sub-brand first registered ? Please provide a link if you can. 4) Is the 'swirl' of the 1988 Seoul Summer Olympics logo connected with the Galaxy name in any way ? At the time of writing, I've still received no reply from Samsung, nor their PR company. However, a work colleague with time on his hands has been doing a little online research. By interrogating the correct source, rather than just randomly googling, he's achieved rather more success than I did earlier. 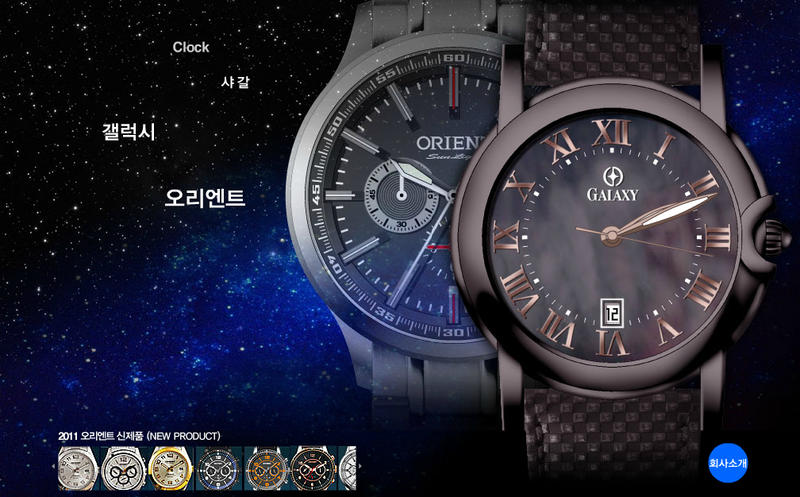 It appears that Orient Watch Co. (Korea) beat Samsung to the mark by a couple of years - then possibly surrended it to them. *Edit. See: http://tsdr.uspto.gov/#caseNumber=73514388&caseType=SERIAL_NO&searchType=statusSearch (click 'Expand All' tab). Having got an address for Orient's Korean subsidiary, last night I went on a googling bender, trying to see what I could find out about their offshore manufacturing operation. As with parent company Seiko, it's almost impossible to glean any facts about their domestic manufacturing operation, let alone offshore - so I did't have very high expectations. 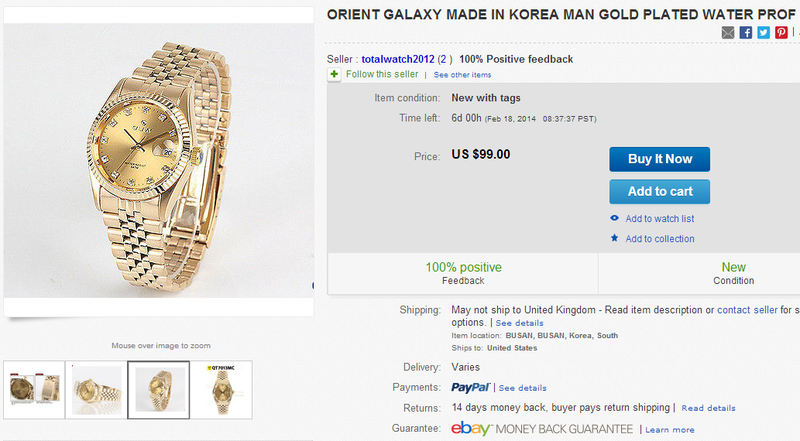 Which shows that although Orient may have abandoned the GALAXY trademark in the USA, it is still active elsewhere. 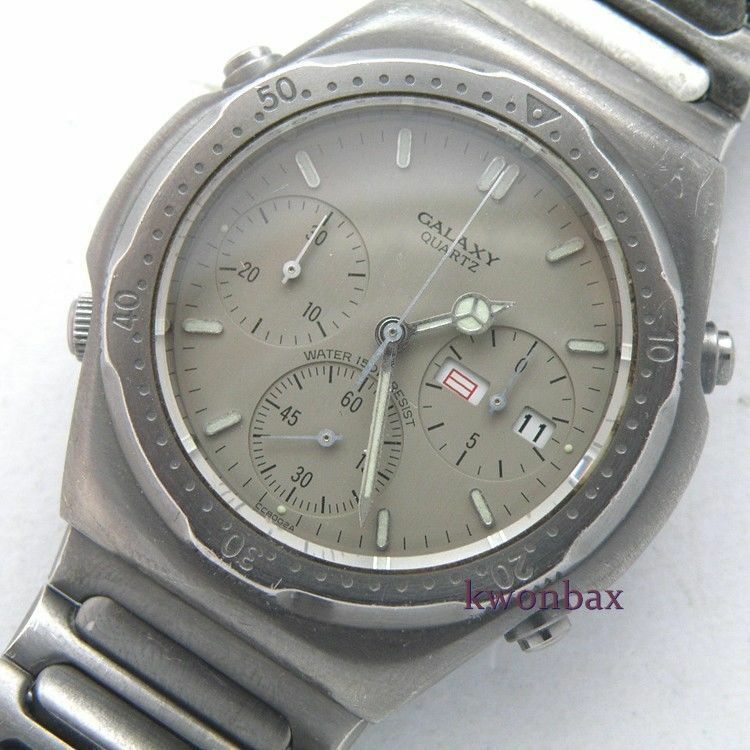 Note the style of font printing used for GALAXY - with over large seriphs as found on the ORIENT and RACER J39's dials. Feeling smug, I emailed the link to my work colleague who had found the (abandoned) US trademark filing. This morning he replied: Haha, well done. Great find, but I can go one better. Where else would you register a trademark for a wrist watch but Switzerland ? 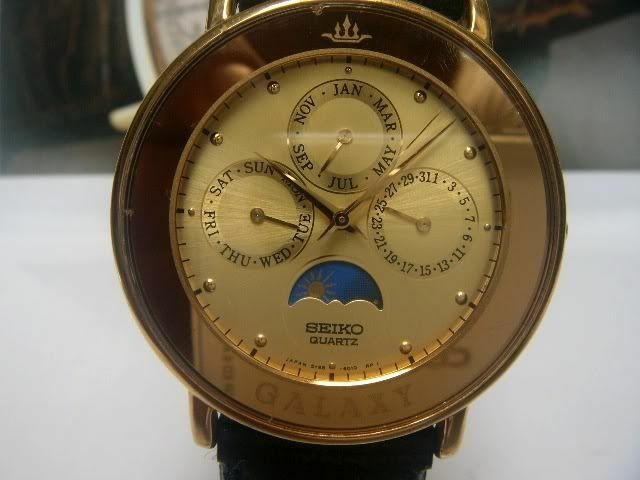 Which reminded me that parent company Seiko also used a Galaxy sub-brand in the 1980's. 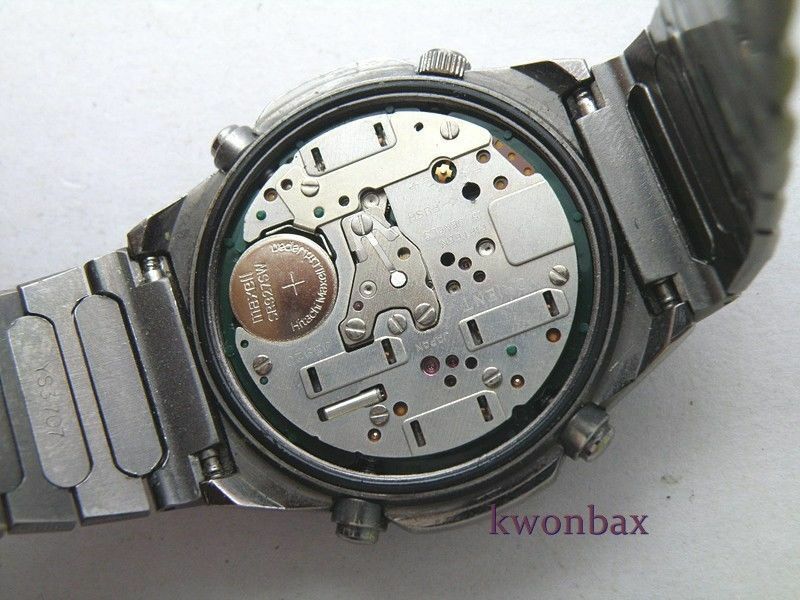 There's a couple of mentions of it in the Seiko Branding Dictionary thread on WatchuSeek - particularly here in post # 7. I don't think the GLX is related to the older Galaxie or Galaxy models at all. They were a low end entry and usually quartz. The distinguishing feature they had was the logo which is quite similar to the current Credor logo. So where am I headed with this, you may be wondering ? Completely the opposite direction from whence I started ! Although I've wasted numerous hours trying to reseach 'the Samsung connection', I'm coming to the conclusion there isn't one. Let's face it - where did the inference come from in the first place ? Korean eBay seller Kwonbax's listing titles and descriptions. 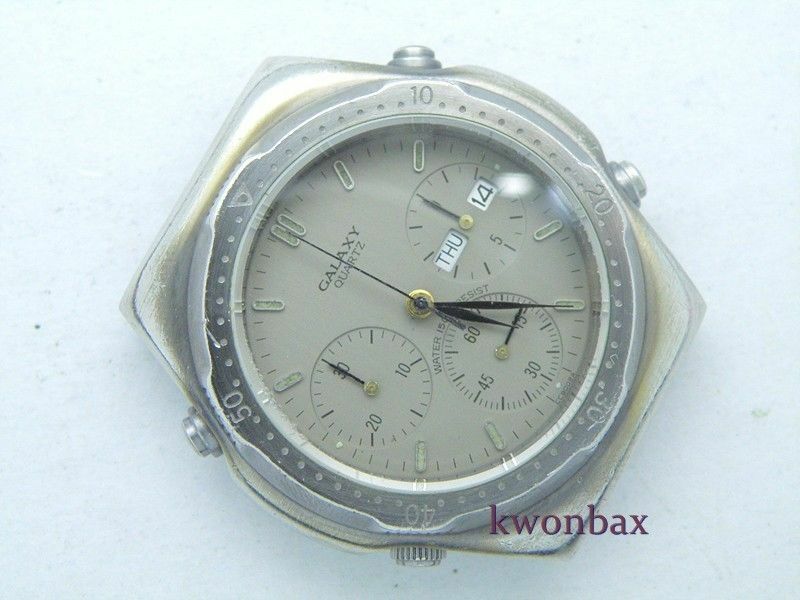 and it was Orient Watch Industrial Co. Ltd. of Korea who attempted to launch this brand at the 1988 Seoul Olympics - not Samsung. If I'm right, then my original title I gave this topic was closer than I'd first imagined. Partly in the hope that they might eventually find another Orient Galaxy '88 Seoul Olymics J39 '7A38' - which they haven't to date. One of them regularly drags up all kinds of superfluous crap (mostly Samsung Galaxy Gear's, needless to say) and needs refining. The other, which includes the words Orient and Galaxy had returned very little until this morning, when once again, this came up. In fact, I'd seen a couple of previous listings for this horrible Galaxy Rolex clone before and not bothered to look that closely at it. 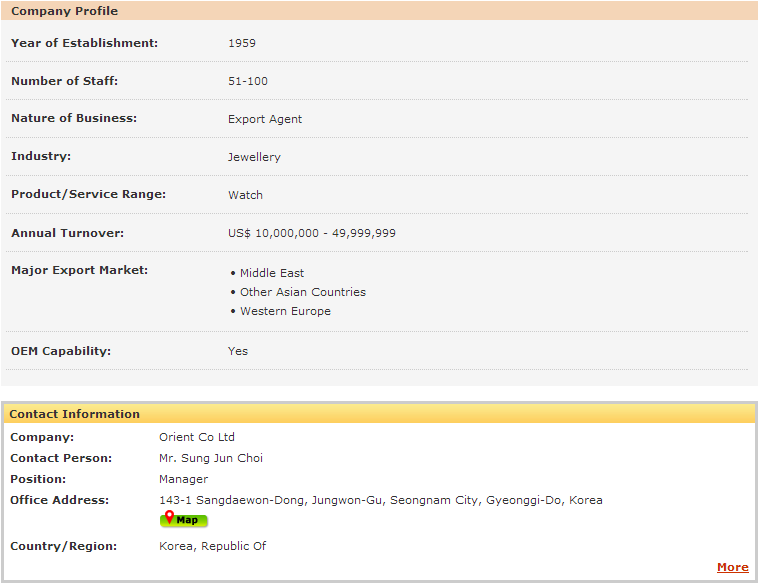 Most of the listing description is in Korean. So I'd never really bothered scrolling down through it. Today I'm glad I did. 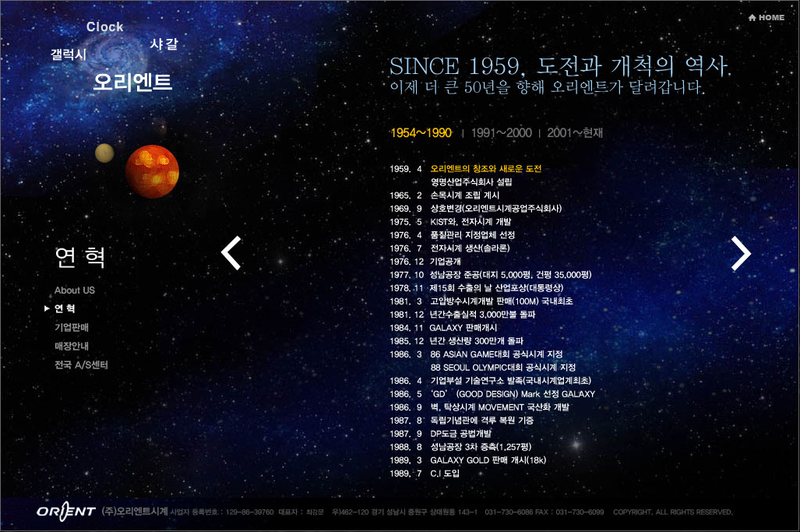 How I'd never managed to come across Orient Korea's own website before, during my previous research is beyond me. 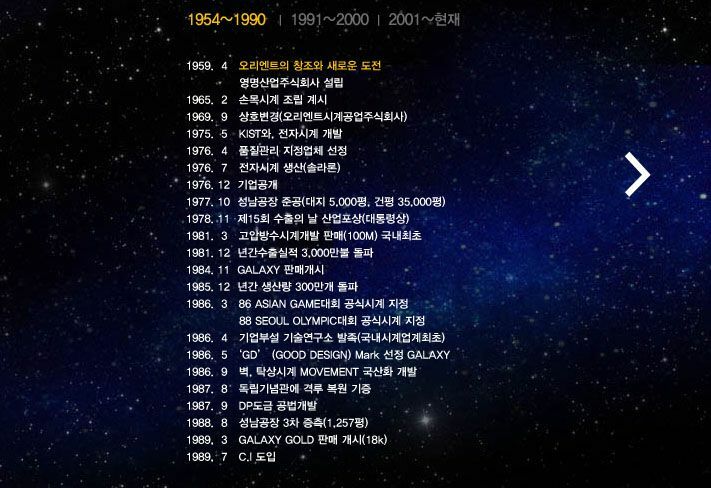 Note their Galaxy brand against 1984 (when the trademark was first registered) and mention of the '88 Seoul Olympics. Unfortunately Google seems unable to translate the Korean Batang / Gulim / Dotum - whatever font it is they've used. Which probably goes a long way to explaining why I didn't find their website, when I was googling like a man possessed in November. Tell you what: when I do eventually get back on the right track - I'm damned good at this online detective work; even if I say so myself. 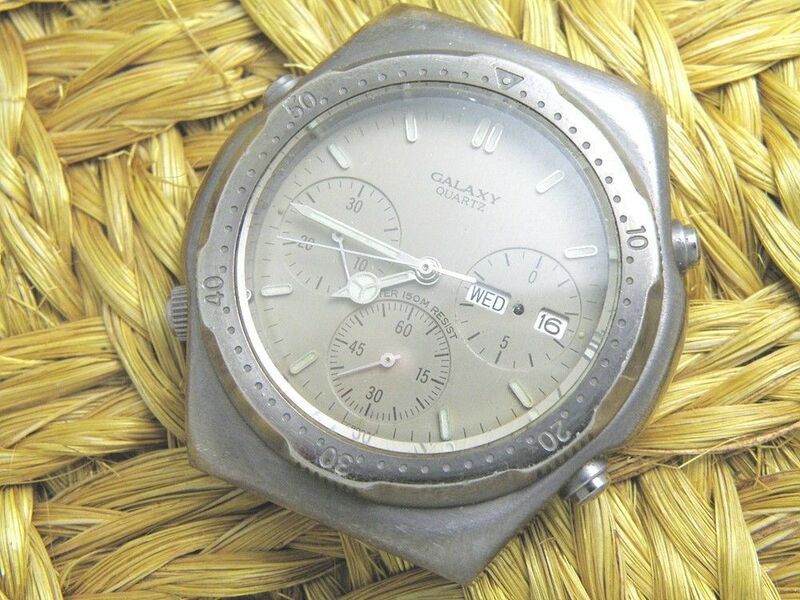 Not only is the GALAXY (and QUARTZ) font the same as on the '7A38's dial, but this watch's dial also has ORIENT printed on it. on this lady's watch the numbers printed at the bottom of the dial and engraved on the caseback are both the same* - J65W083. Hmm. Scratch that theory, perhaps. 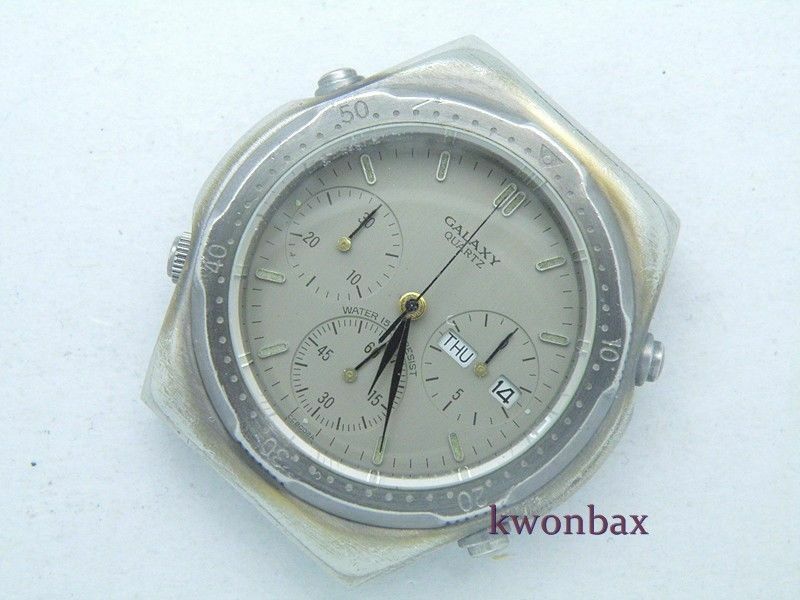 Belated Edit: *As indeed appeared to be the case with other Galaxy models (including several more with Seoul Olympics case-backs) which I found on this Korean watch blog site: http://blog.daum.net/watchmania/ - there are some 166 different Galaxy variants listed ! Looks like Korean eBay seller Kwonbax, or should I correctly say Smith_Speaks, has cornered the market in these Orient Galaxy J39's. I noted with mild amusement that there's no longer any mention of Samsung anywhere in the title and description this time around. Still got his 'Bid with confidence!!' crap in there (twice) though. Oops - nearly forgot to upload Kwonbax's smith_speaks less than inspiring set of photos. 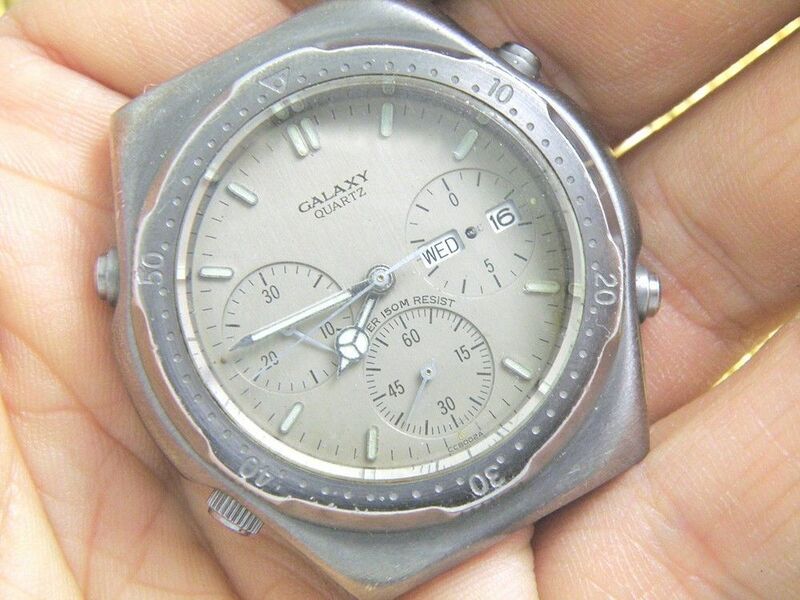 This Galaxy (Orient) J39 parts watch didn't have a great deal going for it - other than an almost complete set of original hands and a better dial than the last 'head only' he sold. Note again, the last 3 digits of the 700xxx serial number are misaligned. 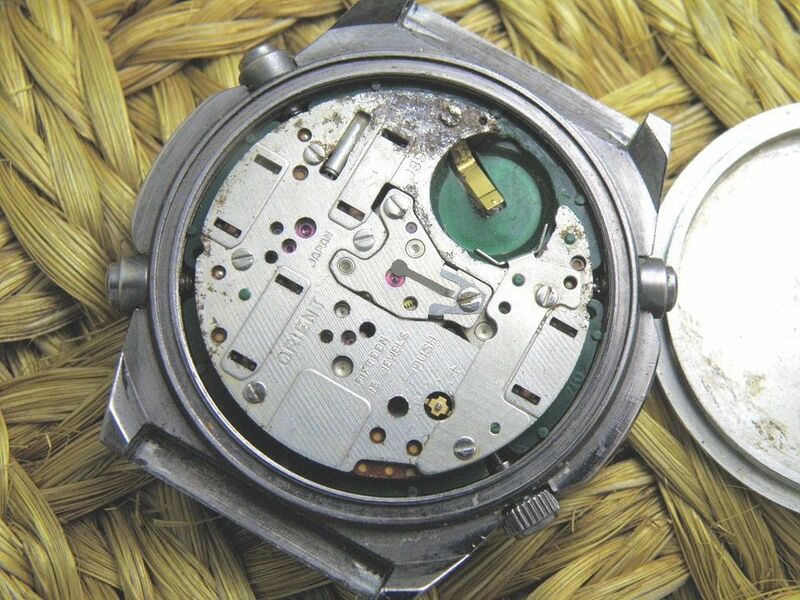 Most of the other caseback markings are all but obliterated. The auction ended 20 minutes ago @ $54.88 (approx. £32.75) after 13 bids. Perhaps I should have made an effort to win the auction. In hindsight, looking at the bidding, I now suspect that $55 would probably have been just enough to clinch it. Regardless, to my mind it would only have been a 'consolation' 3rd prize. Plus there was always the chance that n***b (Stuart Lennard) might place another higher last-second snipe bid on it, just for spite - to rub salt into the wound and I wasn't about to give him the satisfaction of doing it to me a third time. Cutting my nose off to spite my face maybe. Only time will tell. Belated Edit - Something of an amusing post-script. In May, Kwonbax (Smith_speaks) changed his eBay user ID back to Kwonbax ! Subtitled: All good things come to he who waits .... or perhaps more apt .... What goes around comes around (eventually). I make no apologies for copying these next couple of paragraphs almost verbatim from another post of mine, earlier today. Grails are funny things. Sometimes finally attaining them can turn out to be something of an anti-climax - even disappointment. 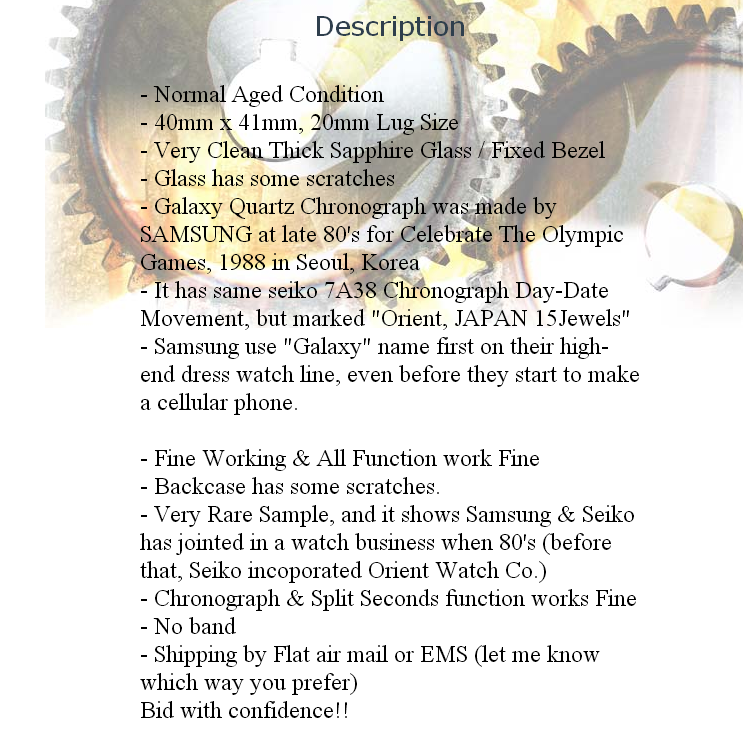 Those who've read this thread will remember the first Galaxy 'Samsung' 7A38 listed by Korean eBay seller Kwonbax in November 2013 and the acrimonious exchanges between myself and erstwhile forum member 'ginny' (Stuart Lennard) which ensued afterwards. Stuart had a major health scare in the latter part of 2014 and was hospitalized just before Christmas. In the prior months he had been selling off his Seiko 7Axx collection probably at a faster rate than which he had accumulated them. Thankfully, he appears to have made a full recovery and after a long cruise holiday has recently resumed selling off what was left of his once impressive collection. Stuart and I 'buried the hatchet' in December last year, when I emailed him enquiring about his health. He has not requested that his membership of this forum be re-instated - and I have not invited him to rejoin. 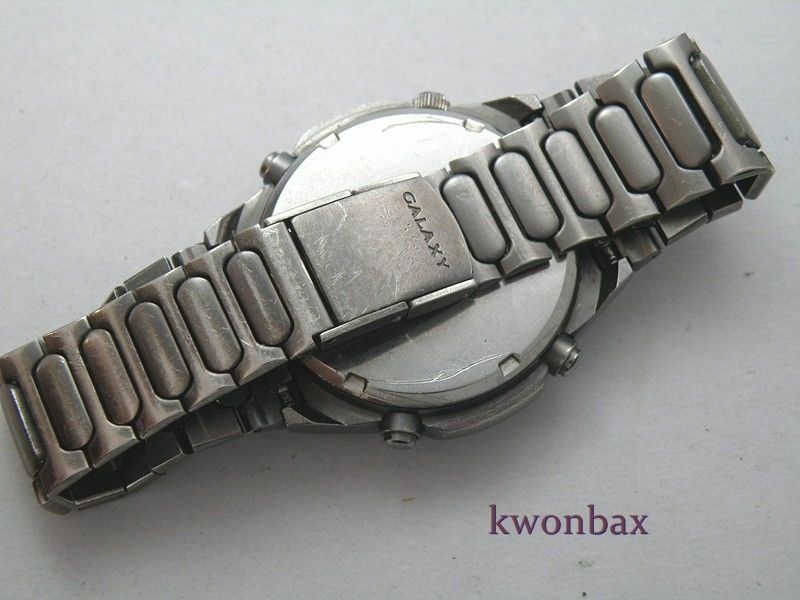 However, he well knew that I might be interested in a couple of his remaining watches, which were still unsold, not unsurprisingly those which had caused the rift in our online relationship - and later generously gave me the opportunity to make him offers for them. Which, naturally I did - and he accepted. One of them was that Galaxy J39.